Now you can explore more, on and off road, thanks to this device’s round-trip routing feature. Simply enter how far you want to ride, and Edge 1000 calculates up to 3 cycling-friendly routes. You can even review the elevation profiles before making your selection. It also offers a new route planner capability that allows you to create routes directly on the Edge 1000 using the map, POI and segments you’ve downloaded from Garmin Connect. Again, you can preview the elevation profile of your custom route before you roll. If you do get off course or want to end your ride sooner, Edge can always guide you back to the start or calculate the most direct route and provide turn-by-turn directions to get you back. 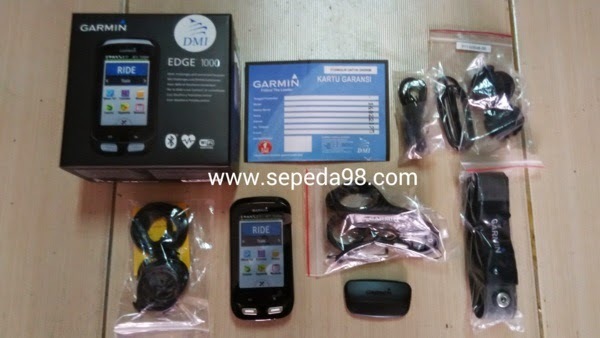 Edge 1000 features a 3-inch high-resolution colour touchscreen display with dual orientation*. It has an ambient light sensor that automatically adjusts the screen brightness to changing light conditions to improve visibility. Unlike your smartphone, the display is optimised to work with gloves and in the rain³. You can customise your training pages with up to 10 data fields and use activity profiles to allow for easy transitions when you switch cycling activity, such as road, mountain or touring. Edge 1000 is compatible with ANT+™ sensors, including speed, cadence, heart rate and compatible weight scale. It’s the first Garmin cycle computer that integrates with Shimano Di2 electronic shifting systems4 to display your current gear on the screen. Edge 1000 is also compatible with ANT+ power meters, including Vector™, our unique pedal-based power meter that measures total power, left/right balance and cadence. A preloaded power-based workout on Edge 1000 allows you to calculate your functional threshold power (FTP), from which you can base your power training zones. The 1000 offers a training calendar and is compatible with advanced workouts, which you can plan, schedule and upload from Garmin Connect. 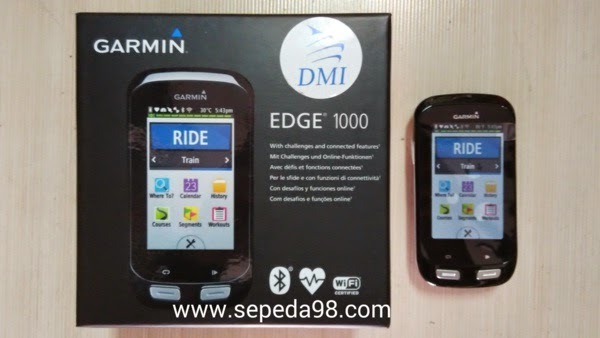 When paired with your smartphone and the Garmin Connect™ Mobile app, Edge 1000 offers a suite of connected features, including live tracking, incoming call and text alerts, social media sharing, weather, wireless uploads and the sending/receiving of courses and segments. * As soon as your ride is complete, the data can be automatically sent to Garmin Connect via Bluetooth® or Wi-Fi®. This lets you stay connected and instantly share the details of your ride with friends, family and social media contacts. LiveTrack allows your friends and family to follow your races and training activities in real time. Invite followers using email or social media, so they can view your live data on a Garmin Connect tracking page. Once they get your email invite, they can click to follow and see your stats and location on the map. ini fungsinya buat apa yah gan ? ?